Today's music culture seems geared to the single. 99 cents on iTunes, why buy the whole album if you only like one or two songs? I'll tell you why. Because the artist(s) released an album, not a single. A lot of thought goes into which tracks go on an album and even which order they go in. These musicians want us to listen to their whole album, not just the single that gets all the radio play. Love me some concept albums, and Canadian rock band Rush does it better than most. In a post-apocalyptic future where music is outlawed by the religious totalitarian state a man finds an old guitar in a cave, figures out how to play it, & is blown away. When he shows the Priests his discovery Bad Stuff happens. Prog-rock at its finest as only America's Dream Theater can do. This is another concept album featuring past life regression, epic tech-metal riffs, and a twist ending that would make M. Night Shamalamadingdong jealous. Please give me your favorite albums Topia. I'm not the only one who can commit to 40-80 minutes of music at once, am I? Edited by Phineas_Carmichael, 18 April 2015 - 01:27 AM. Edited by TurkeyRanch, 18 April 2015 - 01:37 AM. Another excellent thread by Mr. Phineas Carmichael! Phin, one of my favorite albums of all time, is the example you gave of Rush - 2112. I was a teenager when it came out on album originally lol. It would be fair to say that favorites like this one are timeless, because the music is just as important and true as it was the day it was penned. I come from the era BEFORE even 8-track tapes. Buying an album used to be a wonderful adventure in picking one up, then learning it and learning to love and apply it into my life. I could write for pages and pages about just that one thing! lol I doubt that this old dawg will ever change, Thank God! Phin, I'm jamming on your American Dream Theatre link above. I LOVE IT and it seems like I've heard it all before. Topia, help these guys out if you can, my recent struggles have even affected them, and it's killing me. They have a lot of links where there music can be listened to for free, or downloaded for a little of nothing. It is all original. Their most recent offerring is called Barnabas Collins... Their first 2 were The Winter of Evermore, and Creation Damnation. Give it up for the TrueBloodz! Edited by MezzMezzrow, 18 April 2015 - 03:54 AM. I like listening to whole live shows. I knew one of you deadheads would show up & mention live shows. I agree, every live show is like a new album. That Chicago 1977 show is a good one for sure. It's one of Bev's favorites too IIRC, no? Phin, I'm jamming on your American Dream Theatre link above. I LOVE IT and it seems like I've heard it all before. Edited by Phineas_Carmichael, 18 April 2015 - 08:37 AM. About the Grateful Dead, I've never been to a Dead show although I'm a member of the family of all true deadheads. With a quick search I find that I can see them at Soldier Field around the 4th of July. Talk about a procrastinator! LOL If I can't get a way to that, there is also a special live show that was made in 1989, never before seen, that is coming to theatres in select areas on May 4th! "Grateful Dead Meet-Up at the Movies: Alpine Valley 7/19/89" will only be playing on the silver screen for one night! Come out and connect with Dead Heads in your neighborhood on Monday, May 4th at 7:00pm local time. Also, when you attend that on May 4th, you get a chance for tickets to see this..... http://www.fathomeve.../fare-thee-well Can a get a hell yeah out there!?!? It's one of Bev's favorites too IIRC, no? I just can't get enough. My earplugs are named 'Jerry' and 'Donna'. No joke. Why hasn't anyone mentioned Pink Floyd? Kings of the concept album. I could listen to Animals and Atom Heart Mother all day long. 76-81, great years. Funny you mention that May 77 run, I listened to the 5/8 show today, actually have it playing for the second time at this very moment . . . I have that whole run downloaded on my ipad. I have been listening to those shows over and over a lot lately. SuperMusic for the soul. I wasn't born yet, but my mom made it to some of that May 77 run. Like Bev mentioned, Floyd certainly did a good job of making an album comprehensive. Another favorite for me to listen start to finish album wise is anything by Tool. They are pretty out there. Edited by TurkeyRanch, 19 April 2015 - 12:06 AM. Does the Donna earplug occasionally screech jarringly at just the wrong moment? 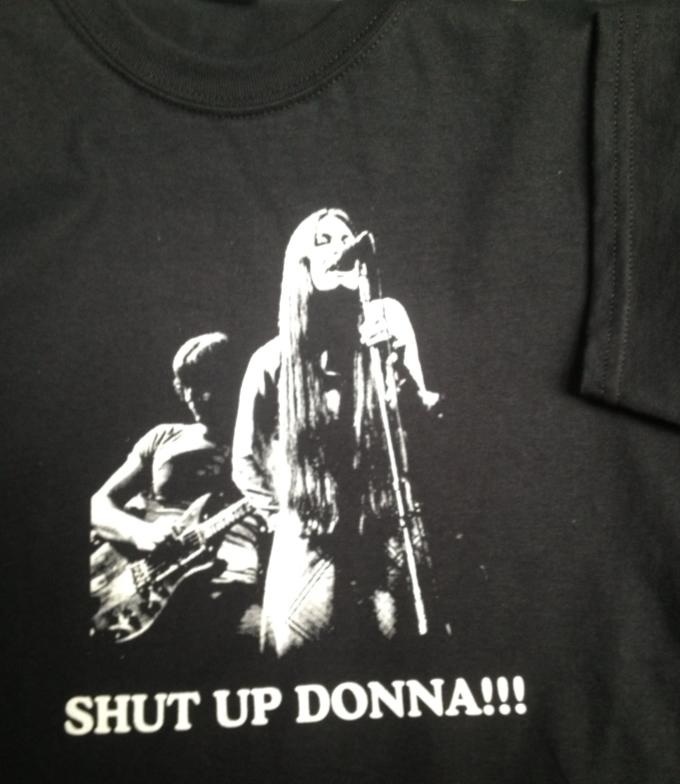 I can't help but laugh when I see someone in a "Shut up, Donna!" T shirt. Edited by TurkeyRanch, 18 April 2015 - 11:38 PM. Edited by MezzMezzrow, 19 April 2015 - 07:56 PM. Edited by MezzMezzrow, 19 April 2015 - 08:16 PM. Edited by MezzMezzrow, 19 April 2015 - 09:52 PM. I've been known to get stuck on an album for months! This one brings back old memories, and new insights!